Grand Rapids Jazz Orchestra with Edye Evans-Hyde, 12:30 p.m.
Kevin Jones and Tenth World, 3:30 p.m.
HEADLINER: Euge Groove, 8 p.m.
Student Jazz Band: Lushh, 1 p.m.
Nelson Rangell and Steve Oliver, 5:30 p.m. If you like variety in your jazz, bring a lawn chair down to Grand Rapids’ Rosa Parks Circle Aug. 18-19 and kick back. 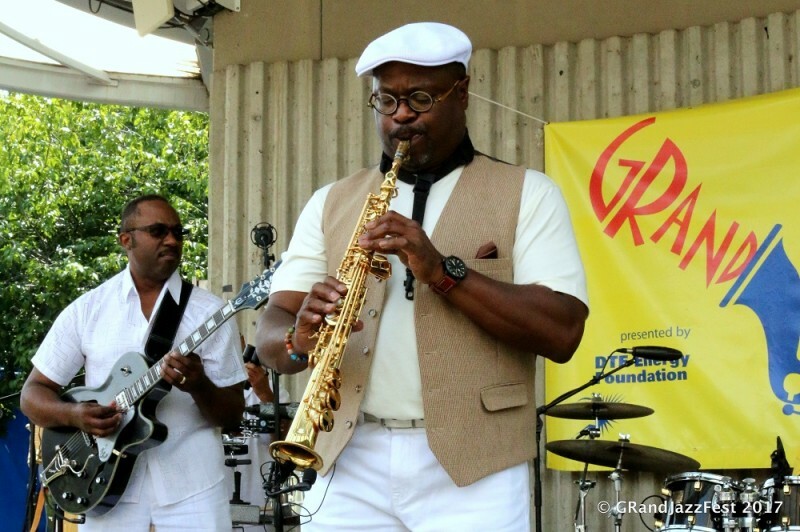 GRandJazzFest presented by the DTE Energy Foundation has announced the performance lineup for its seventh annual music festival, and it’s got the jazz genres covered. Saxophonist Euge Groove headlines the free, two-day festival. The internationally known saxophonist is one of 10 performers and bands that will take to the Rosa Parks Circle stage. The eclectic array of jazz acts includes big band to straight-ahead, contemporary to Latin-Cuban and more. Festival organizers announced the performers at a Lineup Reveal Party held April 30 at H.O.M.E. at The B.O.B. in downtown Grand Rapids as part of International Jazz Day. In keeping with tradition, GRandJazzFest will open its seventh annual festival on Saturday, Aug. 18, with the Grand Rapids Jazz Orchestra featuring vocalist Edye Evans Hyde. For nearly four decades, the Grand Rapids Jazz Orchestra has been one of Michigan’s premier jazz ensembles, featuring some of the finest musicians in the area that play swinging original compositions and arrangements, as well as traditional favorites. Recognized as the 2011 West Michigan Jazz Society Musician of the Year, Edye Evans Hyde has been singing jazz, blues and pop music for more than 30 years in West Michigan, Los Angeles, Asia and Europe. Next on the performance lineup is saxophonist John Gist. Born and raised in Grand Rapids, this alto, tenor and soprano saxophonist has mastered a wide variety of musical styles that include jazz, funk, blues, R&B and gospel. Gist is known for his ability to play funky rhythms one minute and, in the blink of eye, make audiences melt with soft, sultry notes in the next. Kevin Jones and Tenth World is a group created by percussionist/band leader Kevin Jones and pianist/composer Kelvin Sholar through a partnership that began in 1999 in New York City. Jones and Sholar formed a collective of talented master musicians on the cusp of realizing a new sound that combined the harmonic sensibilities of jazz and soul with the rhythms of the African Diaspora. Jones, originally from New Jersey, recently relocated to Michigan. He’ll combine some of the original members of the band with local talent, including Grand Rapids native Evan Hyde on drums. Also performing on Saturday is keyboardist Oli Silk, called the UK’s “smooth jazz ambassador” who has built a large U.S. fan base. Silk began writing and recording music as part of jazz funk duo Sugar and Silk in the late 1990s. Silk now has five CDs to his name, all under the Trippin’N’Rhythm label. He remains one of the most dynamic and energetic keyboardists in the genre. His unique mix of jazzy instrumentals and funky vocals bring excitement to his live shows. Lin Rountree, a.k.a., “The Soul-Trumpeter,” also performs on the Rosa Parks stage at GrandJazzFest 2018. Rountree is an accomplished recording artist, producer and live performer. With six solo projects, 12 chart-topping Billboard singles and numerous collaborations with some of the industry’s top R&B/contemporary jazz artists to his credit, he’s poised to be one of the most renowned artists of his generation. After receiving his degree from Florida A&M University, he found his home in Detroit and has since performed extensively throughout the region. In 2012, Rountree appeared in the hit film Sparkle starring Whitney Houston, boosting his international profile. GRandJazzFest 2018 headliner Euge Groove – a pseudonym for saxophone journeyman Steve Grove – takes the GRandJazzFest stage Saturday night, Aug. 18, at 8 p.m. Grove began playing piano in the second grade and turned to the saxophone at the age of nine. His teacher gave him a classical education on the instrument, which he followed at the University of Miami’s School of Music where he became interested in jazz. After graduating, he initially remained in Miami doing sessions and playing in bands such as Expose, where he can be heard on the group’s 1987 No. 1 single “Seasons Change.” He then moved to Los Angeles and joined Tower of Power, remaining with the group about four years. Following this experience, he performed with such notable musicians and bands as Joe Cocker, the Eurythmics, the Gap Band, Huey Lewis and the News, Elton John, Bonnie Raitt, Aaron Neville, Eros Ramazotti and Richard Marx. Grove’s saxophone can be heard on Marx’s 1991 Top 20 pop and No. 1 adult contemporary hit “Keep Coming Back.” At the end of the ’90s, Grove developed the persona of Euge Groove and recorded a demo that attracted the attention of various labels. This demo soon landed him with Warner Bros. Records. Euge Groove, his debut album, was released in May 2000. At the time, the saxophonist toured in Tina Turner’s backup band. He followed up with 2002’s Play Date, featuring the singles “Slam Dunk” and “Rewind.” In 2004, Grove moved to Narada for the ’70s pop-soul-inflected Livin’ Large. Grove stuck with the ’70s vibe for 2005’s Just Feels Right and then incorporated a more gospel approach for 2007’s Born 2 Groove. He moved to Shanachie for 2009’s Sunday Morning. In 2011, Grove returned with his seventh studio effort, the fittingly titled Seven Large on Shanachie, with two more releases following for the label, 2012’s House of Groove and 2014’s Got 2 B Groovin. On Sunday, Aug. 19, the GRandJazzFest performances start with student jazz band Lushh, an electronic hip-hop jazz ensemble comprised of students in Western Michigan University’s Jazz Studies Program. Lushh’s influences draw upon the likes of Kneebody, Thundercat, Hiatus Kaiyote, Snarky Puppy, Donny McCaslin, Flying Lotus and more. The band frequently performs in and around the greater Kalamazoo area and has begun to play in Grand Rapids and Ann Arbor. Lushh was named Blues/Pop/Rock Best Group in DownBeat magazine’s 2017 Student Music Awards. The popular West Michigan band Grupo Ayé returns to GRandJazzFest 2018, having played at the festival in 2012 and 2014. Grupo Ayé specializes in Afro-Cuban music, which blends salsa, Latin jazz, bachata and merengue. The group’s experience spans performances with such noted artists as Pat Metheny, Tito Puente, Wynton Marsalis, Celia Cruz, Aretha Franklin, Harry Chapin Jr., Englebert Humperdink and Paquito Rivera. Next up on Sunday is saxophonist Marcus Anderson. With eight studio albums on his list of accomplishments, the fusion jazz artist brings together such genres as R&B, pop, rock, Latin and funk. Charting No. 1 on Billboard’s Smooth Jazz and Sirius XM’s Watercolors with his exceptional hit “A Cup Of Joe,” the South Carolina native delivers a major music sound. His work with the late Prince and the New Power Generation led him to join stages with the likes of CeeLo Green, where he has become a key contributor to Green’s touring band. He has also appeared with headliners on The Tonight Show, Arsenio Hall, Jimmy Kimmel Live! and Jimmy Fallon. Nelson Rangell and Steve Oliver round out the GRandJazzFest 2018 lineup with performances starting late Sunday afternoon at the festival. Jazziz magazine writes that Nelson Rangell is “an artist of depth, a master of song, and an improviser non pareil.” The Times of London notes “his extraordinary facility on a range of instruments and his undoubted virtuosity,” adding that Nelson is “one of fusion’s most accomplished exponents.” Such praise confirms what contemporary jazz fans have known since the Denver-based saxophonist emerged in the late ’80s: that Rangell is one of the most exciting and diverse performers in the genre, equally adept at soprano, alto and tenor saxophone, as well as being a genuine virtuoso on flute and piccolo. He’s released 14 CDs nationally and internationally. Joining him on stage is Steve Oliver, an American musician, guitarist, vocalist, songwriter and producer best known for contemporary jazz, although he performs in a wide variety of styles including pop, rock, Latin and electronic. He’s scored multiple hit singles on the Billboard contemporary jazz chart. The multitalented performer demonstrates his breadth with adult contemporary in Pictures and Frames, his first-ever all-vocal album. Oliver is renowned throughout the contemporary jazz world for his charismatic one-on-one relationship with the audience and a wild array of sonic delights that include soulful lead vocals, snappy guitar lines, wild vocal percussion excursion, playful “vocalese” and wonderworking with the synth guitar. The two-day festival is free thanks to Presenting Sponsor the DTE Energy Foundation, as well as the City of Grand Rapids and other sponsoring organizations, individuals and volunteers. GRandJazzFest is a family-friendly event that typically draws thousands to the heart of downtown Grand Rapids. In 2017, the event drew more than 10,000 people. “Jazz is really about bringing people together. It’s about community,” Sundstrom said. Holding the festival in the center city allows festivalgoers to enjoy all that downtown offers including restaurants, clubs, museums, microbreweries and shops. The festival typically occurs during Restaurant Week in Grand Rapids. The festival’s location is easily accessible to those who ride the bus, walk or bike, and is close to parking. GRandJazzFest is pleased to once again announce a special collaboration with the Grand Rapids Art Museum (GRAM). The 2018 festival’s V.I.P. area, which is open to sponsors, will be located on the GRAM front terrace where refreshments and snacks will be provided. Additionally, an outdoor bar will be set up at the base of the GRAM’s front steps adjoining Rosa Parks Circle to offer refreshments for attendees to enjoy during the festival. People can get a taste of past GRandJazzFests by viewing recap videos at http://grandjazzfest.org/newsroom/video/. More information on the 7th annual GRandJazzFest presented by the DTE Energy Foundation can be found at www.grandjazzfest.org. Connect on social media on the festival’s Facebook and Twitter sites, www.facebook.com/grandjazzfest and www.twitter.com/grandjazzfest.